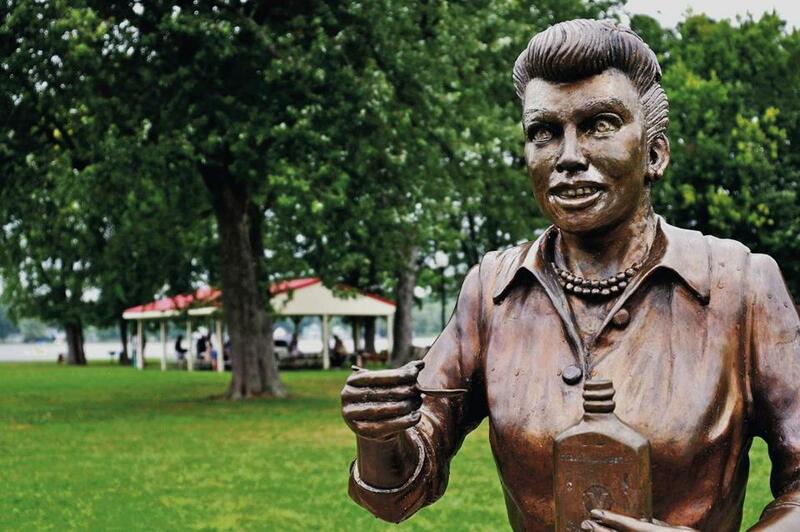 Ernie Boch Jr. ponied up for a new statue of Lucille Ball in Celoron, N.Y., when “Scary Lucy” caused a ruckus. Amid the talk of unicorns and interest rates this year, we had more than a few weird events emerge in the Boston business scene to liven things up. A runaway blimp? Check. 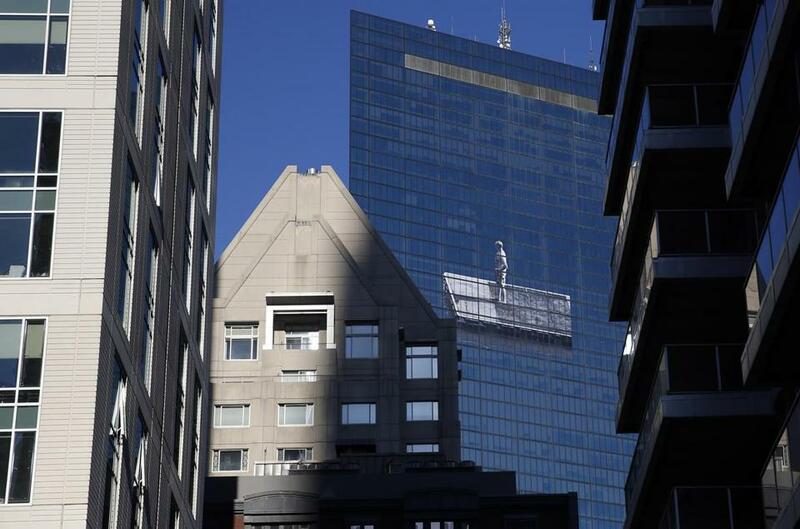 A giant half-naked man on the side of the Hancock Tower? Of course. But no other topic dominated conversations like our record snowfall, with office workers placing bets on when our last speck of snow would melt away (July 14, in case you forgot). At least we laughed a bit along the way, even if our city seemed to be trapped in a giant glacier for half of the year. So let’s grab a shovel and start digging into some of our favorites. Gillette couldn’t have planned it any better if it tried: When Patriots coach Bill Belichick spoke publicly for the first time about Deflategate, he did so in front of a Gillette ad that read “#Flexball.” Interest in the Gillette technology surged on social media. The razor maker says it wasn’t trying to take advantage of all the media coverage around the Patriots’ seemingly flexible footballs. Rob Gronkowski’s got a party boat? Sign us up. But here’s one thing we didn’t see coming from the Patriots star who brought us a floating frat house: the “Gronkonomics” campaign with Capital One, aimed at encouraging people to save their money. It was weird to see Gronk shilling for a bank. But come to think of it, he’s probably more reliable than the band of ragged Vikings that Capital One previously used as its pitchmen. Even in an entrepreneurial hotbed like Boston, some startups still surprise us. Kyle Waring launched ShipSnowYo.com, which promised to ship 6 pounds of white stuff from Massachusetts’ historic snowfall to anywhere in the nation for $90. Waring’s snarky slogan? “Help us revolutionize the snow-shipping industry.” He had plenty to box up last winter, of course. But this winter, he’s had to go out-of-state for supplies. Runner up: Who else but Waring would dream up ShipFoliage.com, which sells dead leaves for up to $19.99 a package? Sure, we had the Runaway Red Line. But that’s nothing compared to the Runaway Blimp, brought to us by Waltham-based military conglomerate Raytheon Co. The football field-foot-long dirigible, known by the obligatory acronym JLENS, went on a wild ride for 150 miles after coming loose from its mooring in Maryland, but not before it took down a number of power lines along the way. Photos captured the aerostat drifting over Amish country. The locals weren’t quite sure what to make of it, other than to make more Deflategate jokes. What is that gray silhouette hanging above Copley Square, against the cold glass of the Hancock Tower (sorry, we mean “200 Clarendon”)? The building’s owner, Boston Properties, wouldn’t say much. Some suspected that it was a picture of Vladimir Putin. Others said Yogi Berra or Whitey Bulger. The man became a kind of a Rorschach test for a city that doesn’t agree on much. But at least we can agree on this: No matter what Boston Properties does, the skyscraper will still be known as the John Hancock Tower. A new public art piece went up on the former John Hancock building on Sept. 24. Keolis, the French company running the MBTA’s commuter rail system (or not running, as was often the case), handed out buttons to staff with a target date to get things back to normal and a message: “March 30” and “We can do this!” Yes, we know it was a tough winter. But shouldn’t it be a given that by the time spring starts, trains should be running without much of a hitch? 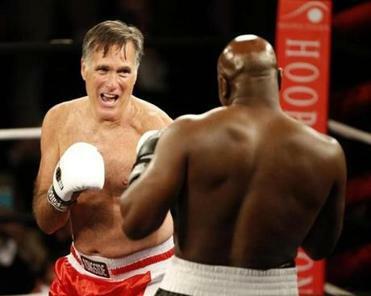 Mitt Romney and Evander Holyfield faced off in Salt Lake City May 15. He defeated Shannon O’Brien, but was bested by Barack Obama. Mitt Romney’s latest foe: Evander Holyfield? In May, the private equity man-turned-politician landed in a cage-match, dubbed “The Quake in Salt Lake,” by donning boxer shorts and gloves and entering the ring with Holyfield, the heavyweight champion, to raise money for charity. Romney still looked a heck of a lot happier post-“fight” than he did on Election Night in 2012. You have to wonder what took the Stoughton medical device company formerly known as STD so long. Finally, in January, it became Primo Medical Group. (The letters, by the way, originally stood for Stoughton Tool & Die, before it entered the medical device business.) The press release announcing the change doesn’t really explain why the “STD Med” moniker was no longer working for the company. A name like that? No explanation needed. Forget, for a moment, all the movies shot in and around Boston lately. In 2015, when we spent roughly a third of the year encased in a giant snowbank, it took a computer game to reflect what it was like to live here. “Fallout 4” gave Boston a starring role as an apocalyptic wasteland. You’ll be glad to know Fenway Park somehow survived the fictional nuclear winter. More surprising: that it survived last winter.